I have decided to make more ready-to-buy dolls in 2016 and will therefore only take two orders for Waldorf dolls each month. 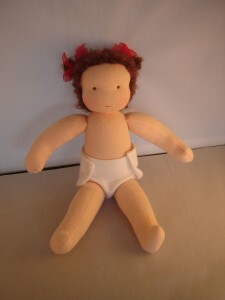 So if you want a custom made Poppelien doll for a special occasion make sure you or order in time. 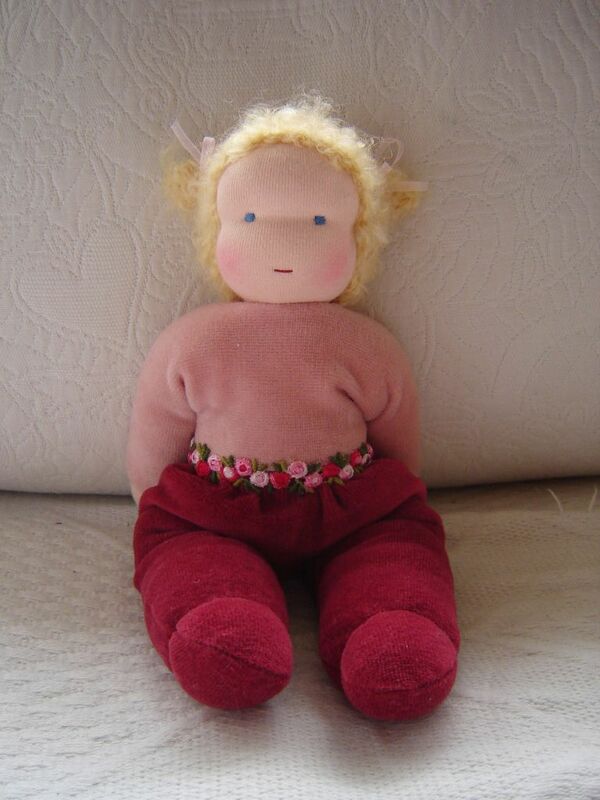 If you would like to order a Poppelien doll, please mail me at poppenkind@gmail.com. I am describing the different possibilities below. 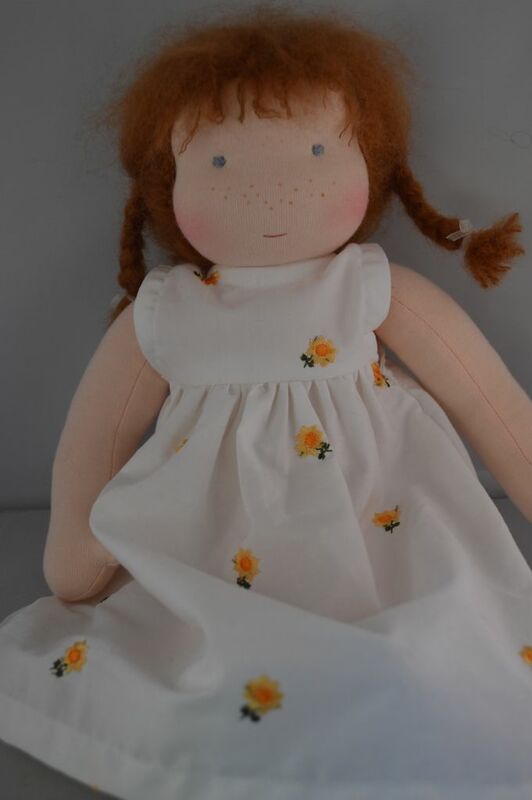 Please order your doll well in advance, there is usually a waiting list before I can start on new orders especially in busy times like Christmas. 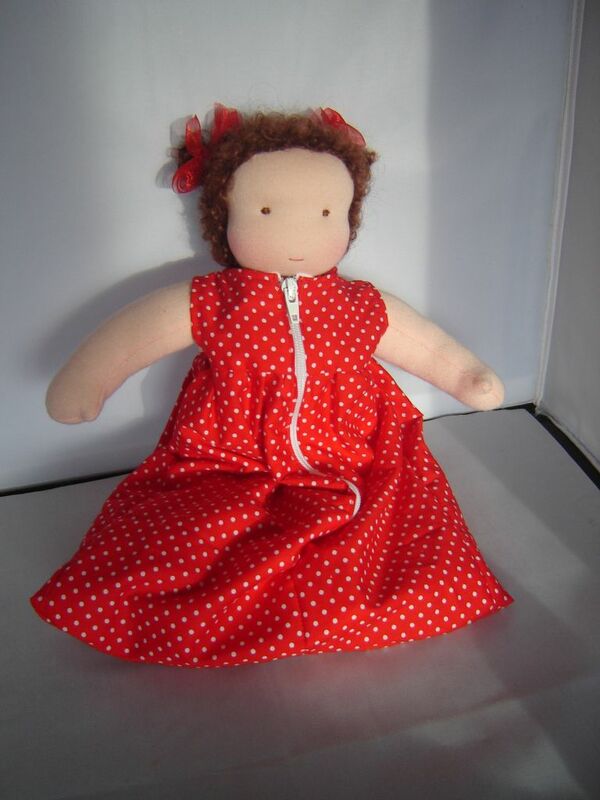 This custom Waldorf doll is about 10 inches and has a body made of soft velours fabric (80% cotton 20% polyester). 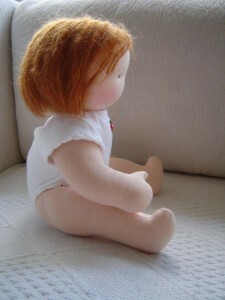 You can choose the colors for the body, you can either chose one colour or two if you like the doll to have a different color for the legs and the arms. 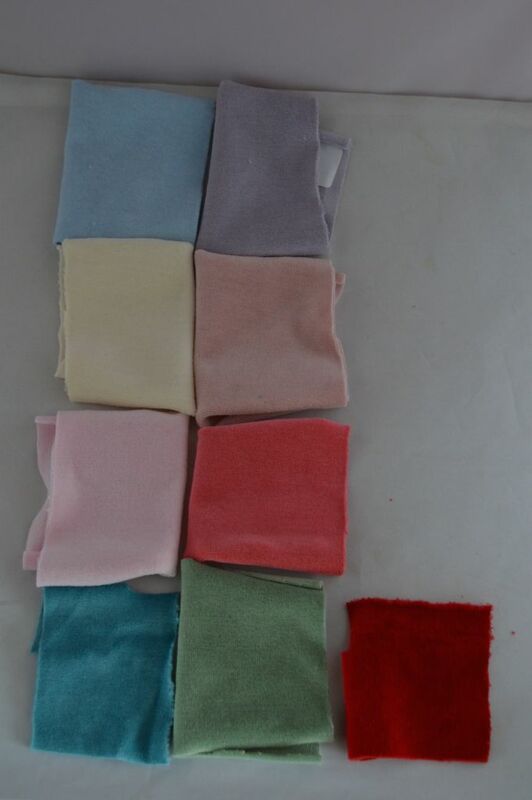 It is also possible to order your doll in organic nicky velours at an additional €5 the colors available for this 100 % cotton fabric are at the moment: left to right top to bottom, (the name between the brackets is the name the supplier uses): soft blue (angel falls), lilac (lavender aura), cream (natural), old pink (zephyr), soft pink (blushing bride), coral pink (rapture rose), blue (pagoda blue), green (green bay), red, (tango red). This type of doll I developed for younger children who would want to dress and undress their doll, but for whom a dress up doll is still too big. 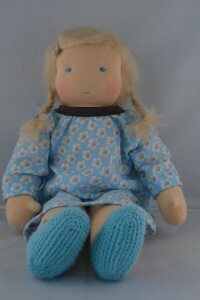 I try to have some ready to go dolls and doll clothes in my Etsy store as well: http://www.etsy.com/shop/Poppelien. The dress up doll is about 14 inches and has quite slender arms and legs, ideal for putting on some lovely clothes. -the outfit, we decide on together you can chose from the outfits shown in the pictures below, and chose your favorite colors and fabric, if you wish for something else I may charge a little extra, for example for knitted clothes etc. 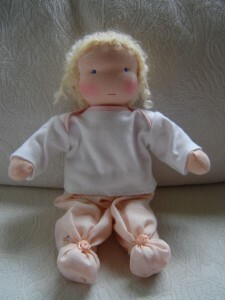 The jointed doll can sit on her own, her arms and leggs are jointed with a thread through the body which makes it a little bit more vulnarable for rough play. 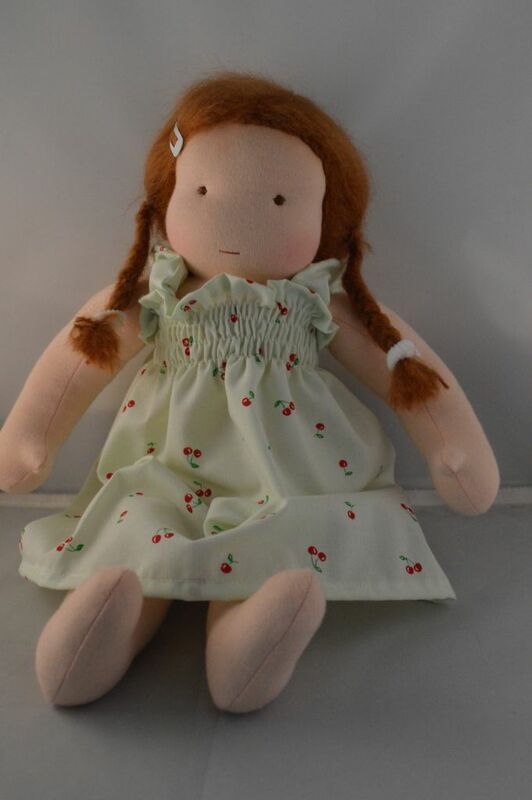 -outfit we decide on together, you can chose for similar outfits as the dress up doll, if you would like something else just let me know and I can let you know what it will cost. All prices are without shipping, worldwide shipping without track and trace is €18. Ik zou graag zetjes kleding bij je willen kopen voor mijn lijs pop. Die van pop sarah( bloemenvestje met roze broekje en ivoren schoentjes) En een witte broderie jurkje.. Kan dat? Hoi. 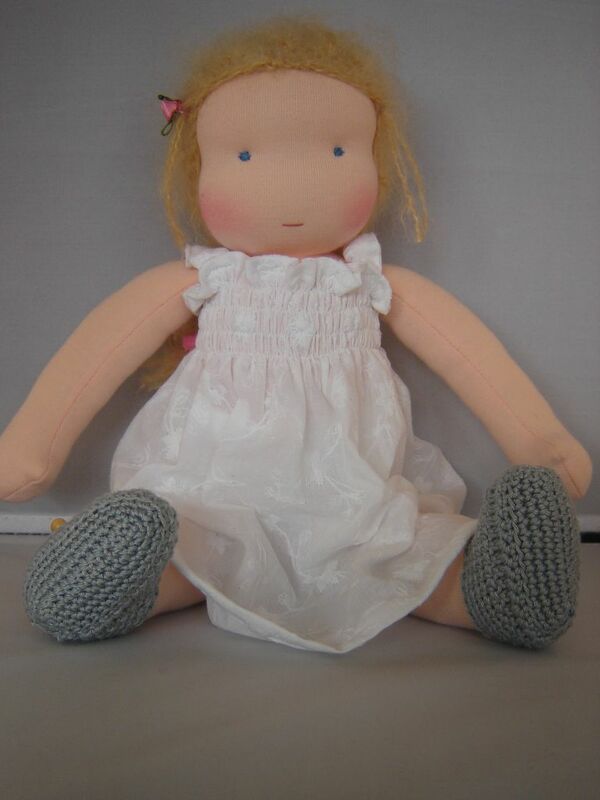 Ik zou graag een pop maken voor mijn dochter die 4 juli 4 jaar wordt.Bied je ook cursussen aan? Ik hoor graag van je. Wat een lieve schoentjes, die wil ik wel van je kopen!